DJI has recently confirmed that some of the Matrice 200 drones are randomly falling out of the sky. The drones lose power mid-flight despite the indicator showing that there’s more battery life. And after investigating the issue, it turns out that the problem is in faulty batteries. The UK Civil Aviation Authority (CAA) issued a safety notice, warning that some DJI Matrice 200 drones have randomly fallen out of the sky. DJI confirmed the issue, saying that they’re working to resolve it – but no one is sure why exactly this is happening. There are some things which you think would be obvious. Like walking out into a busy road full of cars, putting your hand in an alligator’s open mouth, or flying your brand new drone over Apple’s shiny new campus – officially dubbed “Apple Park”. But for some people, apparently, it’s not so obvious. When Assaf Kaufman bought his son a new drone for his bar-mitzvah, they decided to take it out for a spot of flying. So, why not take it for a spin in Apple’s direction? What could go wrong? 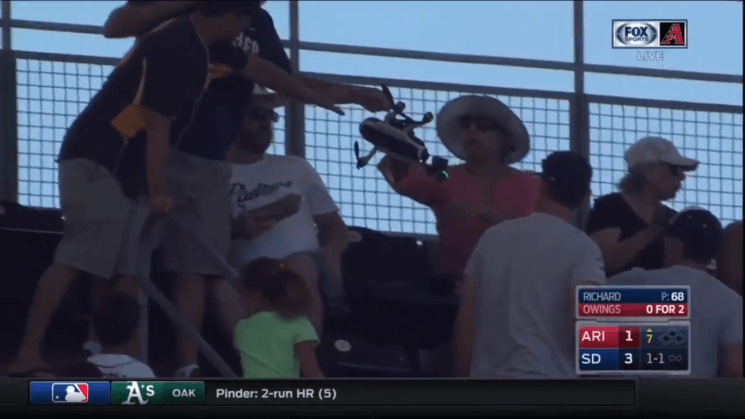 This Sunday, a drone crash landed in the audience during a Major League baseball game. Arizona Diamondbacks and San Diego Padres played a game at Petco, when someone decided to fly a drone above the stadium. The aircraft hovered above the venue, and eventually ended up in the audience. It smashed against an empty seat, nearly hurting one of the spectators. While some of the rules regarding drone flight around the world might seem a little extreme, some make absolute sense. One such law in many countries is that of flying over groups of people. Especially groups of people who aren’t directly involved with the flight. You might remember one drone pilot who disobeyed this rule a little while ago, and was convicted last month. Charged with reckless endangerment, Paul M. Skinner did manage to escape the maximum allowed penalty. But he’s still been ordered to pay a $500 fine and spend 30 days in jail.